Tamarind Paste is a universal ingredient used in Asian, African, Caribbean, and South/Central American cooking. You use it to build up curries, or stir-fry sauces, as part of a meat marination or in cold beverages. I will teach you how to make Tamarind Paste which you can keep in your fridge for further use. Tamarind is a sour pulpy fruit. Elongated and with visible pod sections, it is encased in a shell with the soft pulp around each seed. 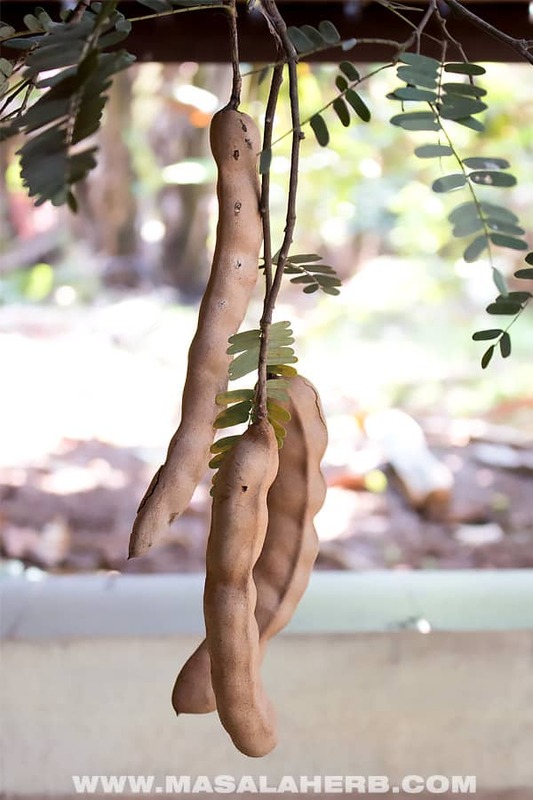 The Pods turn out in different lengths, so sometimes you have one Tamarind with 2 pods and another with 5 and the longest in India up to 12 seeds. The pods are first green and turn brown when mature, the pulp inside is mature when it turns red-brown on the inside. The Tree grows in tropical and subtropical climate and the wood is known to be some of the toughest. Fun fact, many wood mills do no accept or charge more for cutting tamarind wood because of the wood damages blades and machines. Tamarind is actually originally from Africa and found it’s way to Asia in time. The plant was introduced by the Portuguese to South/Central America and Caribbeans. India is the biggest producer of Tamarind, due to the fact that tamarind paste is a common and popular ingredient in the local cuisine. Tamarind Paste is a clean paste of Tamarind pulp without impurities. It’s basically compressed tamarind pulp which can be more liquid or thick in consistency. The Tamarind Paste is used in various cuisines around the world to enhance flavor. It’s a base ingredient for curries but also for popular sauces such as Pad Thai sauce, HP sauce, Worcestershire Sauce. The fruity Tamarind Paste is considered a secret food ingredient for some people in their cooking. The paste gives the food a sour and fruity touch. Is there a substitute for Tamarind Paste? Actually, the answer here would be no because nothing compares to the taste and consistency of Tamarind. Yet you can use Lime juice instead of Tamarind Paste in certain food dishes. It always depends on the recipe. For example, a Worcestershire Sauce would never taste the same with lime juice instead of Tamarind Paste. So for some sauces, curries, marinations you may use lime juice or rice vinegar instead of Tamarind paste. 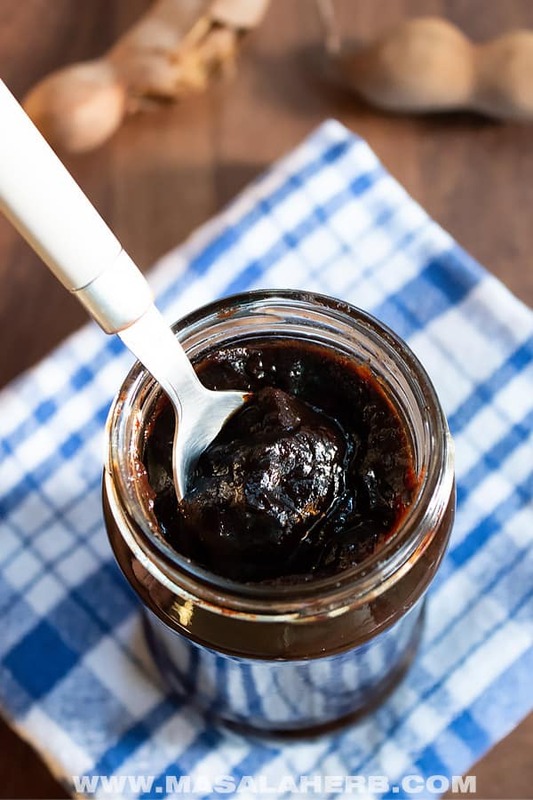 If you plan on cooking more Tamarind based dishes such as Tamarind glazed roasted chicken, then you will greatly benefit from making this tamarind paste at home! Tamarind Paste only requires one main ingredient with some water making it a pure tamarind paste. Eventually, there are variations where some people add some sugar or salt. This is because often while Tamarind pulp is stored with salt to make it preserve longer in a shape of a ball. 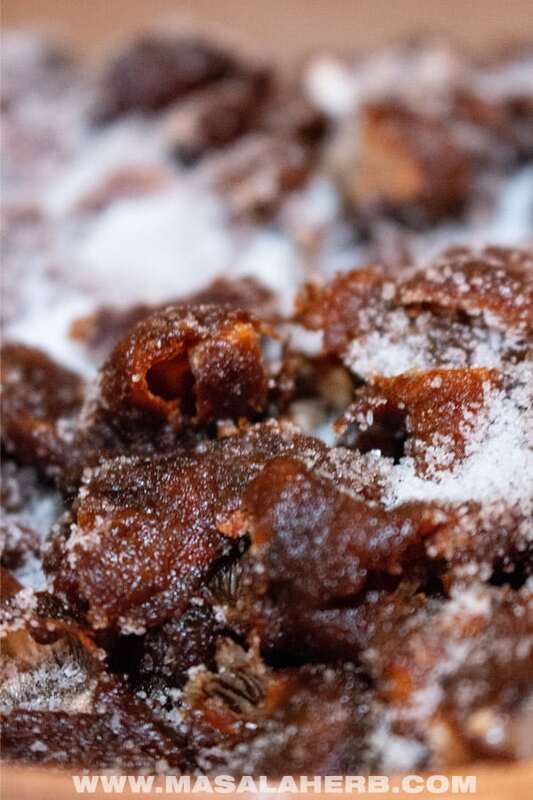 Yet, if you make Tamarind paste from scratch you won’t need to add salt or sugar to preserve the tamarind pulp because we will be heating up the tamarind paste to kill bacteria, so you will be able to store a plainly tasting Tamarind paste. This paste keeps well in the fridge and is used further in sauces, dishes, and drinks. Because it’ s not salted or sweetened, you will be able to use the paste in all kinds of ways. Commercially available Tamarind Paste always includes preservatives and is reduced and pressed into a very thick paste. Those pastes tend to take longer to dissolve too, yet when you make your own you get to decide about the consistency. In what form should you get the Tamarind? 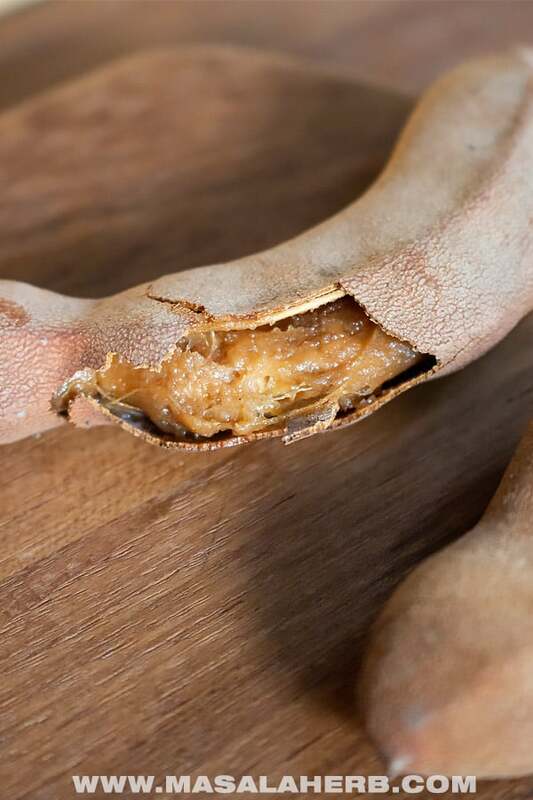 Whole fruit pod with the tamarind pulp – This is the tedious way of doing things and should be your option only if you have a Tamarind tree in your garden (as I do). Don’t buy whole Tamarind pods for that purpose form your grocery store! The Pulp bits pressed together with seeds and fiber, packed in vacuum bags – You get those in your nearest Asian shop or in the Asian shelf section in the grocery store. These vacuumed tamarind pulp packets are not that expensive either when you consider that you can get a 1/4 or 1/2 kg and make a paste of it. Cheaper then the ready-made sold paste. Be aware that some sell packets of Tamarind pulp with fiber and seeds under the description of seedless tamarind paste! Using Whole Tamarind Posts – How to ripen Tamarind? Place the Tamarind pods into the sun with the tamarind case unbroken. This way the pulp gets heated in the case with the natural sun rays hitting the pods. Leave them there for a longer period of time. We did that for 2 weeks at least. Now comes the not so fun part (except if you are in the pension then this might just be fun). Take out the pulp with the seeds from the case as good and quick as possible. The Tamarind casing makes great manure! We keep the fiber and casing around trees, trees grow better that way. At this point, people usually press all the tamarind pulp pieces together to save space. Some people mix salt in if they plan on storing it for a longer period of time to use it that way in their cooking or to process it at a later stage. You can press the tamarind together and keep what is need to make pulp. How to make Tamarind Paste? What you will need to do it separate all the fibers and seeds from the pulp so that you have a clean batch of pulp. It’s not rocket science, just a bit tedious when you do it for the first time and you are not used doing anything like that otherwise. It can be long when you stand there in your kitchen pressing the tamarind pulp through a sieve, and yes you will use your fingers, but tamarind doesn’t stain and goes off easily. It’s worth it to make your own batch of tamarind paste. To make your life easier you will need to keep the Tamarind fruits bits in hot water for at least 30 minutes. The longer you keep it the better. You could eventually also add the tamarind pulp to an instant cooker or regular pressure cooker and cook it soft. I like the conventional way better as it just involved leaving the pulp to soak so that it gets off the seeds and fibers easily. Then you will need to work the tamarind bits with your hand by pressing the pulp. Eventually, you will feel most of the pulp falling off the seed. Some will still remain on the seed, so you can do a second run for that. Take the pulp with fibers and seeds to a sieve and press through the pulp into a container below to collect the pure tamarind pulp. Use a spatula and your hands to do this. It will take some time but you will get there. The fiber and seeds will still be covered with pulp so you can just take those for a second round so that the maximum of pulp comes off. Then discard the seeds and fibers to your compost, it’ s great manure! The seeds are used in bigger industries to press out tamarind seed oil. Now the Tamarind pulp will be heated up to kill any bacteria. This is a must because you just worked through it with your hands and you don’t know where the tamarind has been. I like to use a non-stick PFOA-free Pan such as the Tefal pan to make life easier. You can use a frying pan or saucepan, whatever works for you. The heating up reduces also the paste. It’s up to you how pasty or liquid you want your Tamarind paste. I like it more liquid but if you are short on space then you might want to reduce the Tamarind paste to a thicker consistency. Next, keep your jar ready. Keep in mind that we have created a sauce which needs to keep over a longer period of time, to do so we need to use sterilized jars and lids. To sterilize your jar and lid keep in boiling hot water or in the oven (I do the water technique). Store the Tamarind Paste in the fridge. Flexible Spatula to press the Tamarind through a large fine Mesh Sieve to get the job done. 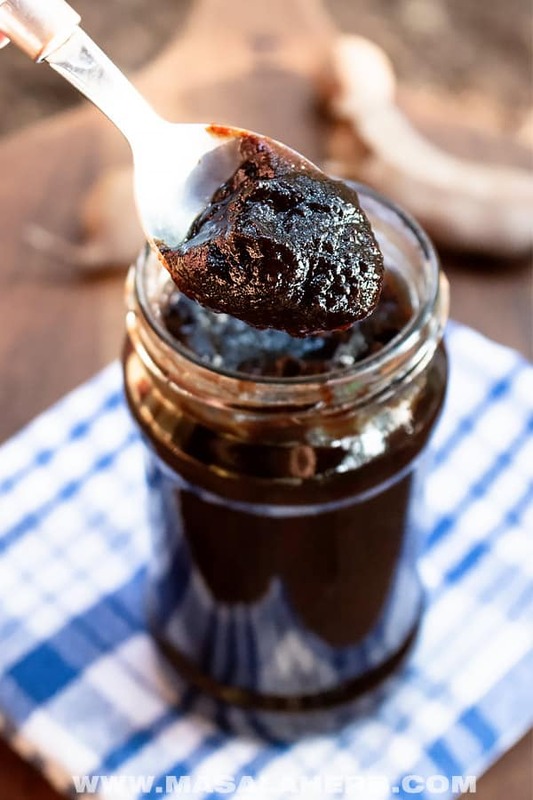 DIY homemade Tamarind Paste from Tamarind fruit pulp. This paste can be stored easily and used for various dishes and drinks. 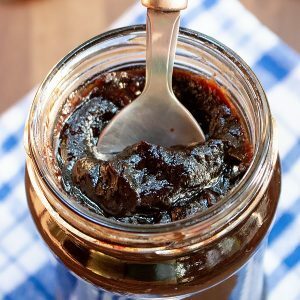 You can prepare the following from scratch with tamarind pulp: Pad Thai Sauce, Worcestershire Sauce, HP Sauce, Meat Marination, Ketchup, Dipping Sauce, Tamarindo cold beverage, Cocktail, various Curries and more! Chef's around the world count tamarind paste to their secret food ingredients. Grab a bowl and break your compressed Tamarind into smaller chunks. Add the hot water over it and let the tamarind soak for at least 30 minutes so that the pulp gets soft and detaches from the seed pod and other impurities. Then mash your tamarind with your hands to help the pulp detach from the seeds and prepare a pot with a large fine sieve. Pour the tamarind into the sieve. Now with a spatula press the tamarind pulp into the pot. The seeds and impurities will remain in the sieve. Take out the impurities back to the bowl and add some more hot water (just a bit), mix and press through the sieve for the second time. As you will see a lot of tamarind pulp is left on the seeds and lot comes off when you press it through the second time. Discard the seeds and impurities, they make great manure material for plants! Place your pot with the cleared tamarind pulp/paste on the stove and heat up. The aim is to kill all bacteria and if you want you can reduce the paste to thicken it more. 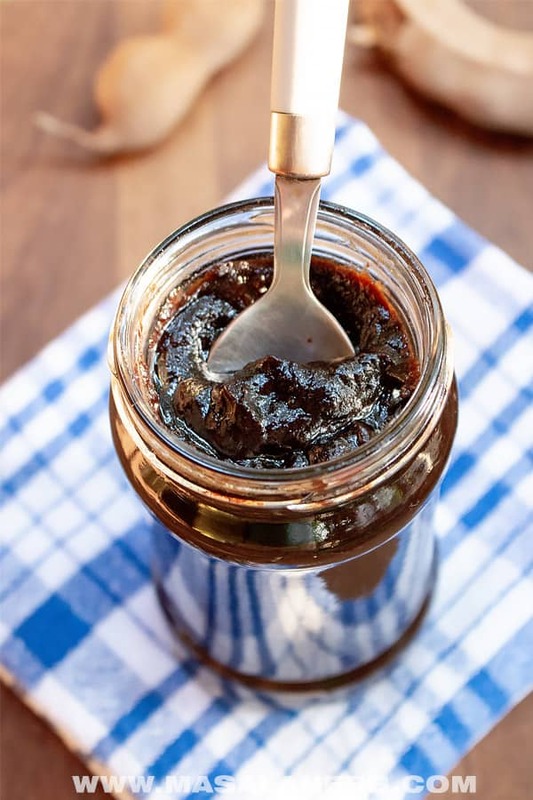 Pour into a clean sterilized jar and store in the fridge for further use. You can choose to use compressed packed tamarind or use fresh tamarind. See my post for more info. Do not skip the cooking part, you need to kill the germs in the tamarind paste, therefore it needs to be heated up. Dear Reader, How are you planning to use the Tamarind Paste? What a concise description, thank you. I bought a tamarind block many years ago (before the internet) and was intrigued. The first time I made a dressing with it, I was horrified to see bits of shell in it, so naturally, I pressed it through a fine sieve (too small a quantity to use a vegetable mill). I had no idea the shell was common, I figured I bought a bad batch. You have inspired me to have this sour paste in my pantry again! Thank you. Both JT and I adore sour, we can both eat limes like an orange but only I can eat lemons like that! This is a fantastic reference post. We use tamarind quite a bit in our Thai cooking. We also love Thai Tamarind candy. Have you ever had this? How long will this tamarind paste keep in your refrigerator? Sharing, of course. I just learned about thai tamarind candy a little while back but I hadn’t tried it yet. They sell whole Thai tamarind here, they taste different too. You can store the tamarind paste safely for minimum 3 months in the fridge without it going bad if you follow the instructions as explained. Hi, this may be interesting you: Tamarind Paste - How to make Tamarind Paste!